In a recent conversation with a deep-thinking friend, we grappled with the question of how we learn new things. He shared a viewpoint helpful in his industry and it struck a responsive chord with me. Most of us have a mental image of learning derived from our experience in school. We view learning as a linear process. We start out needing to know something. We learn it. We progress through several intermediate points and then finish, knowing the subject. In this view, we are relentlessly "moving on," wanting to satisfy the current learning objective and then anxiously getting after the next topic. An alternate view, however, is more accurate, he surmised, and I think is right as we learn and teach about Lean. 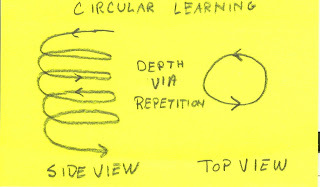 In this perspective, learning is circular. Rather than going from point to point, the learner comes round to the same things, but at progressively deeper, more complex levels. When viewed from the top, the learner appears to be only going round and round. A side view, however, reveals a corkscrew, not a circle. The learner comes back to topic again and again, digging progressively deeper and deeper into the topic. In the 10+ years I've been pursuing Lean, I see this as a better mental model for learning. For example, I know about single-piece flow and have seen it work. But I still miss batches, all around me. I have much more to learn. 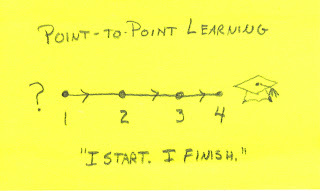 I would be foolish to put a "check mark" next to "Flow" on my "Lean Curriculum" and seek to move onto the next subject. For the one learning Lean, this means a conscious openness to learning more about things I already know. It means a posture of humility, recognizing I always have more to learn. For the one leading Lean, this means an awareness that repetition is something to practice and not apologize for doing. It means being very aware of the next level of depth to which the individual learner must go. It means the leader must also be learning. Depth comes from repetition. Don't be afraid of it.